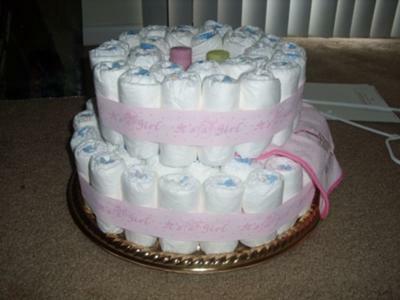 What a fun theme for a diaper cake! It turned out so cute and it looks so good with the other baby shower decor. And the 'recipe' below is very helpful also! 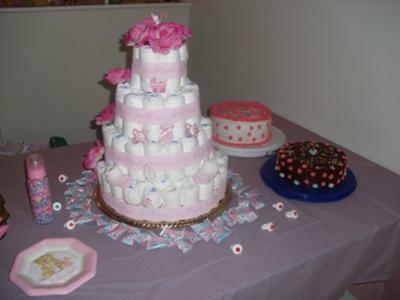 Charleen is sharing this wonderful diaper cake with us after creating it for her sister. 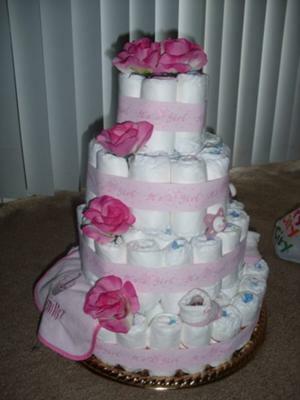 We have added her cake to our fabulous diaper cake gallery, which is full of creative and cute diaper cakes - all from our amazing readers! Thank you so much Charleen! Love your cake! 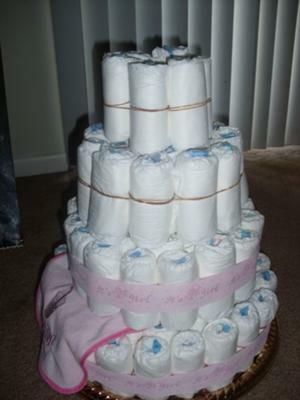 Pay it Forward and share YOUR diaper cake with us right here! This Cake was made for my sisters Shower which was held in April and she was Due in May. So I named it April Showers May Flowers! Everyone Loved it! It was my very first cake. which I learned from this website! I rolled out my Diapers wrap them with rubber bands. Then I layered it one layer at a time. In the middle of the cake was Baby wash, powder and lotion. I kept going around till I reach the top. A Pretty ribbon wrapped around to cover the rubber-band then add a touch of Scrap booking embellishments and Topped it off with the Flowers dripping over to the side. I hope you like it! Such a pretty design. Well done!